All sound samples were produced by micing a Rivera Fandango amp. 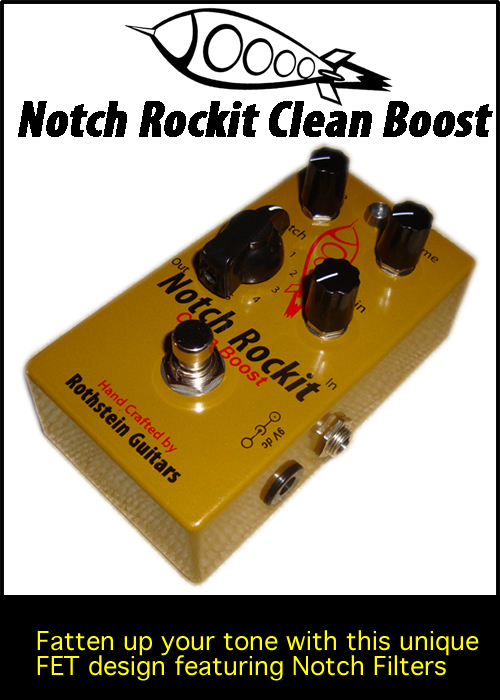 Notch Rockit is a high-end clean boost pedal providing you with up to 20 db of clean gain. This is the only clean boost on the market with notch filters. 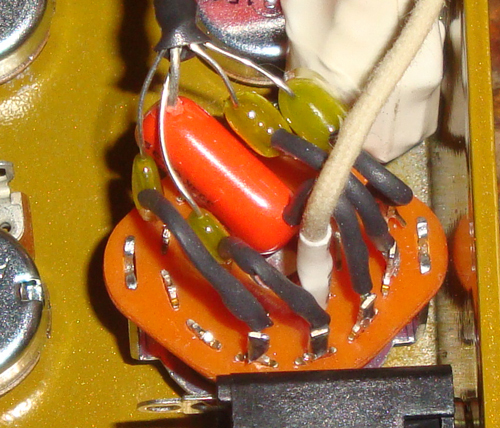 The pedal is built around a AD822 FET based Opamp (Field Effect Transistor). The beauty of FETs is that when pushed they exhibit a "tube like" quality. 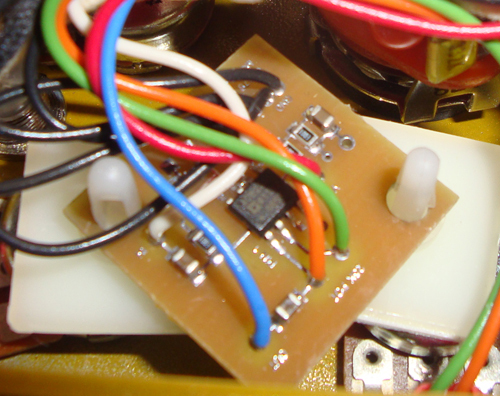 The pedal has true bypass switching, and is hand built using only the finest components. ...or, you may use it as an attenuator. You can crank your amp up to 9 or 10, yet leave the volume on the Notch Rockit down low and you will get that great high gain sound out of your amp but at "bedroom" level volume without any tone sucking. ...or, you may simply use it as a high quality "buffer" enabling you to retain your high end, even over long cable runs. FET design + top notch components = great tube like tone!! High Input Impedance (1M) and Low Output Impedance (10K) means there is NO tone sucking and it will interact extremely well with your other pedals. Powder coated finish with professional screen printed graphics. 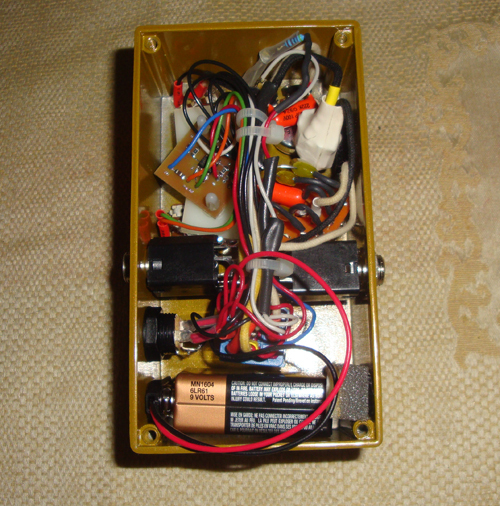 Measurements - 4 5/8" x 2 1/2" x 1 1/2"
In the course of a career as a guitarist there are often times when one thinks 'Why don't they make a stomp box that is a combo boost / attenuator, but also make my humbuckers sound like single coils when needed.' The Notch Rockit is a box that fulfills one of those 'Why don't they...' yearnings. It allows U to get your sound 'to the sweet place' without high volume levels and as if that's not enough it also gives U control over tuning in the perfect EQ for your own personal tone. All this in a very groovy looking retro stomp box. 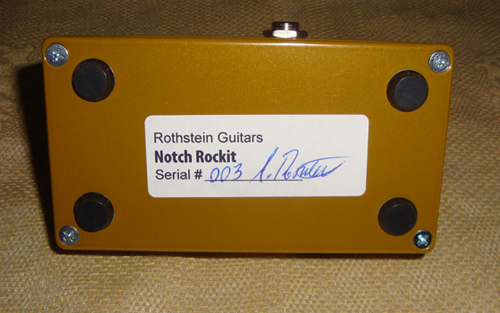 I've played them all and the Notch Rockit is the real deal!" "Love the Notch Rockit!. The boost worked perfectly. I could not detect any tone change at all - and I tried to get one! The notches were really cool. They gave the guitar an acoustic tone in positions 3 and 4. Really nice. Also, I really loved using it as an attenuator. I set my guitar's tone and volume where I wanted. I then set the pedal gain at around one o'clock. Then I start increasing the volume on my amp while backing down the volume on the pedal. I get the amp up to to 9-10 but at a reasonable volume and without affecting the tone. I'm way happy with the results. " just received, opened, threw on my Fender DR and G & L Tele, and pounded out some stuff...just cuz I could. Anyway, I won't bore you with a long story, however, this is a killer pedal! Like a lot of us, I have purchased, and still have many fine pedals from many distiguished sources, always looking for that one that shapes the sound you hear in your head. Couple of Love Pedals(Eternity Fuze, Amp10), etc., etc. Guys, your pedal shapes tone like no other I have come across. It does just what the sound bites portrayed, unlike most others (to my ears). Thanks Andy for a great, no, exceptional addition to my board. I know for a fact I will eliminate a couple of pedals because of this! "There are many effects pedals in the hyperbole crusade of true bypass that claim to achieve sonic purity and unhampered guitar tone. And righteously, the Notch Rockit not only lives up to it's claims, but has a few additional surprises as well. I like my amp set fairly flat with just enough push to breakup according to my own playing dynamics, and I like to hear my 57 classics breathe. 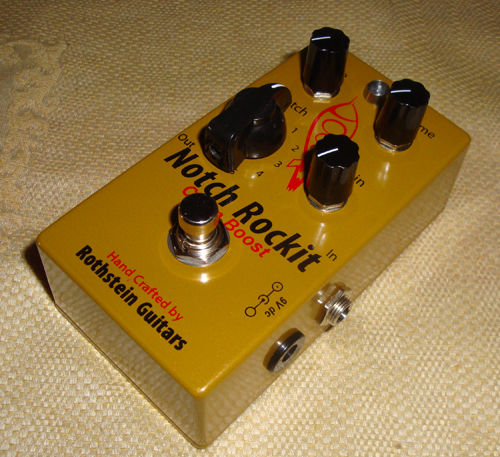 As I field tested the pedal; putting it through it's paces of each notch, tone, gain and volume settings, I noticed that the Notch Rockit not only acts as an excellent attenuator, but a clean boost and a subtle overdrive as well! Talk about having a truly functional pedal in your arsenal? 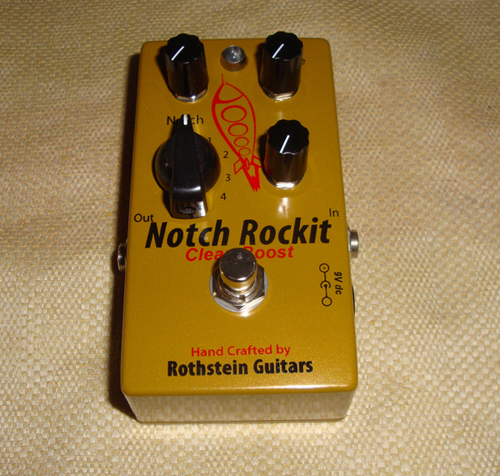 With the Notch Rockit, I've got a clean boost with overdrive, an attenuator and a box of tone shaping all in one!"